Lights - Hello! Can you tell me where the light fixtures are from? Thank you!! Similar Lanterns are also available from www.gascopperlanterns by The CopperSmith from www.gascopperlanterns.com. Georgetown and Yorktown Collections. Beautiful lantern, I was wondering if you have two hanging lights, 1 on porch and 1 in foyer, which one hangs high and which one hangs low? @rosesoldani - the answer to that question depends on the style of the light and your home. Many people like to see both fixtures through the transom above the door, so these were hung in reference to that. Where did you get the doorway? love everything about this entry! Is the siding on the house real wood or another material such as hardiplank? - I am building a farm house similar to this and really struggling with this decision. Everyone is trying to push me toward hardiplank, but I look the look of wood so much better. Thank you! Porch is Trex? Our architect & builder are recommending Azek-- any opinions on the difference? Thank you! Where is the flower pot from? I love them- thanks! Re link: Thanks for providing a link to the 2012 Southern Living Idea House Resource Guide. FYI, the link provided did not work on my smart phone as it is to a dropbox location. It did work on my computer (perhaps because I have a dropbox account there). Thanks again! Also, it's great you downloaded the 2012 Southern Living Idea House Resource Guide to dropbox, because the original Southern Living URL is broken. hello Antwon, Were you ever able to track down these planters? Anyone know what the fourth plant is? - I can see there is fern, hydrangea, potato vine. Can anyone identify the very fine leafed fourth plant? It's best seen in the planter on the right. Thank you! Target sells that door mat. Love the pots at entry..I need them!!! Great lights! - Love the Bevolo Lights!!!! We agree. They are fantastic! Porch Floor color - What is the color/brand of the stain on the porch floor? Unfortunately, we don't have it on file. It was likely picked by the interior designer. What is the size of these planters? Thanks. Tom, we were the architects and don't have any info on the planters. Sorry we can't help. Door Manufacturer? - The proportion of the sidelights and transom is perfect. Having trouble finding a door where the width of each pane of glass appears to be the same in both the transom and sidelights, especially with impact glass. Would you be able to recall the door name and/or Manufacturer? Thanks in advance for any clues you might provide. This was an Idea House for Southern Living magazine and many of the materials and products were provided by sponsors. Marvin Windows and Doors was a sponsor, but we can't say for sure that they provided the door. I took a quick look through the document below and could not confirm. We'd have to pull detailed construction drawings to get those dimensions, and will see if they are easily accessible or archived. But, this is a Southern Living Idea House. They may be able to answer your question quicker than we can. Here's a link. Paint - What is the exterior wall and trim paint color? If you click on the "More info" link below the picture and then scroll down, you will see previously asked questions. We are pretty sure we already answered this questions and you should find the answer there. If not, please email us at inquiries@historicalconcepts.com and we'll look up the color for you when back in the office. Can you tell me where to buy the ceiling light? Color? - What is the brand and name of the color white on this house? Ceiling material - What is the ceiling made up of? Is it hardie or tongue or groove? In this case, the door was a lovely heart pine, so the interior was left natural. Unfortunately, I don't have a photo. Indoor entrance rug - Where can I find the indoor entrance rug? Would you mind sharin the dimensions for the sidelites/transom panels? - Thanks for any info! I'm trying to put together a similar entry and want to match this approximate scale. The glass panel sizes would be helpful. I'm afraid that I don't have the specific dimensions readily available. No, unfortunately I can't confirm the source. However, I've been told that Restoration Hardware has something similar. 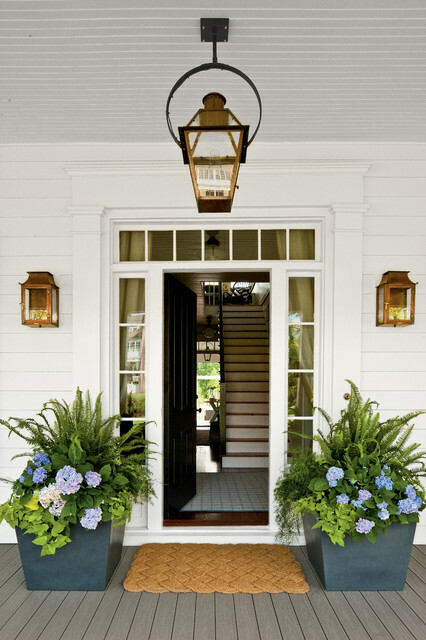 Keep It NaturalIf the entry is already bursting with details, such as eye-catching hardware and light fixtures, a neutral mat will help keep the attention on them. Natural doesn’t have to mean boring. A woven texture ups the visual interest of the natural doormat seen here. Door with sidelights. Light fixtures.